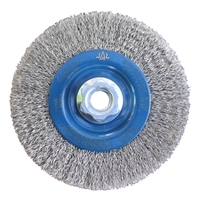 Applications: These brush wheels are ideal for cleaning stainless steel welds. They are also useful for cleaning paint, rust and other coatings off other surfaces. The crimped wire is more flexible and less aggressive than twisted knot equivalents, giving a more controlled action. Unusual for radial brushes, this is speed rated for standard angle grinders. Product Notes: Rated speed 13,000rpm making it suitable for use on standard fixed speed angle grinders. M14 fixing is common to angle grinder spindle 115mm and above. Stainless steel grade AIS 1302.